Banner of Light, The. A Weekly Journal of Romance Literature and General Intelligence / An Exponent of the Spiritual Philosophy of the Nineteenth/Twentieth Century. 1857-1907 Weekly, and then monthly in last issue (1907) Boston, MA, except for a very short period in New York in 1859. Publisher: Isaac Rich and Luther Colby, then by L. Colby & Co.. Editor: Luther Colby (1857-1894); John W. Day (1894-1897); Harrison D. Barrett (1897-1904); J.J.Morse (1904-1905), Irving F. Symonds (1905-1907), assisted at various times by Epes Sargent, Hudson Tuttle, S.B. Brittan, W.J. Colville, et al.. Succeeds: The Life; Agitator, 1860; The Spiritual Telegraph,1860; The Spiritualist (Macon), 1861 Vol. 1/1, April 11, 1857-vol. 100, January 1907. $2.00 (and then $3.00) a year. The longest lasting and most important American spiritualist journal. It had its quirks, like its inability to condemn any medium, no matter how fraudulent, and its unwillingness to take a position against the "free love"/radical side of spiritualism, but its pages are an indispensable tool for understanding the growth, development and decline of the spiritualist movement. Everyone of any importance in spiritualism at one time or another worked for or contributed to the journal. It always claimed to be the most widely circulated spiritualist journal, with subscription numbers in the range of 15,000-30,000, but the claims were enormously inflated and masked the journal's precarious position as it lurched from one financial crisis to another. By the early 1890s it had been surpassed in all but the reverence of spiritualists by the Progressive Thinker of Chicago. "FORTY COLUMNS OF ATTRACTIVE READING, comprising Capital Original Stories; Off-hand Sketches of Life; Historical Pictures; thrilling Adventures; Home Circle; Ladies' and Childrens' Department; Agricultural Facts, Mechanical Inventions, Art, Science, Wit, Wisdom, the Beauties of Poetry, and a General Summary of Political and Social News." Only in the third issue, perhaps heartened by the response to Mrs. Conant, did the publishers announce that the interest aroused by the journal's offerings on spiritualism "has induced us to render this feature yet more prominent and attractive." Starting with the following issue, the journal promised a "Department of Spiritualism" and "two entire pages" devoted to the movement. Thereafter, the Banner became what it was perhaps intended to be from the beginning: "An Exponent of the Spiritual Philosophy of the Nineteenth Century." 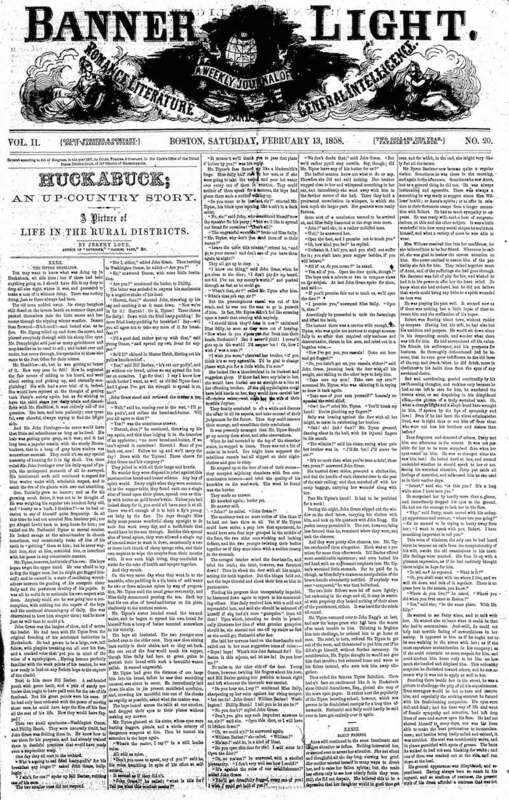 Throughout the almost 50 years of its existence, the Banner appeared weekly in the same eight-page newspaper format, regularly filling 40 columns of almost 150 lines each (almost 150 million words in all) with the Sunday sermons of Henry Ward Beecher (as had The Spiritual Telegraph and Fireside Preacher before it) and other prominent ministers; original essays on topics of spiritualism and reform; extensive book reviews; notices of lectures and debates; a column of "Movements of Lecturers," tracking the whereabouts of all of the mediums and lecturers of the era; regional "Departments" to track the development of spiritualism outside the Northeast; innumerable letters from leading American spiritualists debating the controversial ideas of the day; and finally, "original novelettes of reformatory tendencies," with titles like Rosalie, or, The History of a Haunted House," "Nora, The Seeress," "Bertha Lee, or, Marriage," "Seacliff, or, Love's Struggle," "Consella Wayne, or, Will and Destiny," etc., etc. Often several novels were run concurrently. In every issue the Banner also featured the famous "The Messenger" or, as it became, "The Message Page" of short communications "from the departed to their friends in earth-life." For the first 18 years of the journal's existence these were received through the instrumentality of Fanny Conant, the medium employed by the Banner for its thrice-weekly free seances in the journal's spirit room, and then by Jennie S. Rudd for three years, followed by Mary Theresa Longley, who filled the office for 14 years, and others. So successful was the feature that various other journals took it up, with Longely at different times acting as "message medium" for The Light of Truth and The Voice of Angels. To confirm the authenticity of the messages, the Banner also printed letters from readers who recognized the communicating spirit; no accounting was ever made of the spirit messages that failed to attract confirmation from readers. The last issue as a newspaper-formatted weekly was vol. 99, no. 26, on August 18, 1906, which carried the ominous announcement that volume 100 would see the journal as a monthly and pleaded for subscriptions: "Are you with us?" The public was not. Vol. 100, no. one, did appear, in January 1907, as a 54-page, monthly, but even in its new format it could attract neither contributors nor subscribers, and no more were forthcoming. Colby, who edited the journal for almost 40 years, began his career as publisher of the New York Recorder (1845-1855) a Baptist paper in New York. Both Colby and William Berry, one of the original investors in the journal, were among the "clandestine publishers" in Boston who took advantage of the excess capacity of modern printing presses to publish to publish a string of "books and newspapers considered racy by contemporary standards." Elizabeth Haven Hawley, "American Publishers of Indecent Books, 1840-1890" (Doctoral Dissertation, Georgia Institute of Technology, 2005), 322-328. NYPL microfilm; University of Texas, Austin; NYS Library; Boston Athenaeum; Boston Public Library; and many other locations in OCLC.